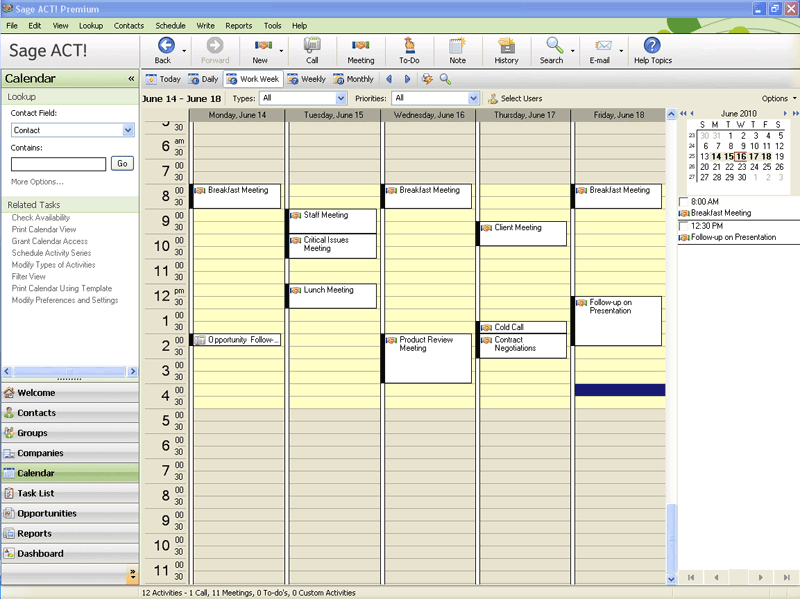 Smart Tasks handle your marketing and sales to-dos with automated workflow. Get started with one of many sample Smart Task templates2 and accompanying email templates for the most common activities. 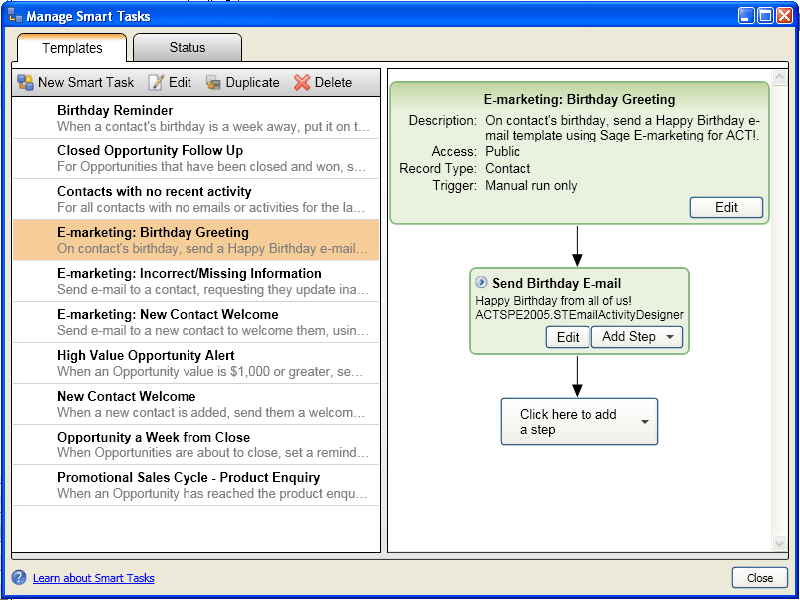 These Smart Task templates will set in motion the most basic or advanced processes, including reminders of your best customer's birthday, customers that haven't heard from you in a while, or welcoming a new customer. And, best of all, you have total control over the timing, contact lists, and opportunities for each and every Smart Task. Apply Smart Tasks right out-of-the-box, make changes to fit your specific needs, or create your own. Take communications to the next level. 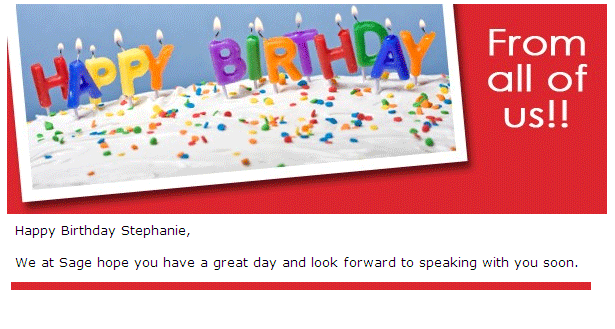 Since Smart Tasks are fully integrated with Sage E-marketing for ACT!1 you get access to templates that allow you to send cheery birthday greetings and welcome new customers, among others.2 You can edit those emails to include additional content, graphics, and links. Track the interest level of emails you send that are associated with Smart Tasks, like sales opportunity follow-ups, by viewing which customers are opening what you've sent. Sage E-marketing for ACT!1also enables you to request updates or missing contact details from your customers by emailing a link to an online survey. 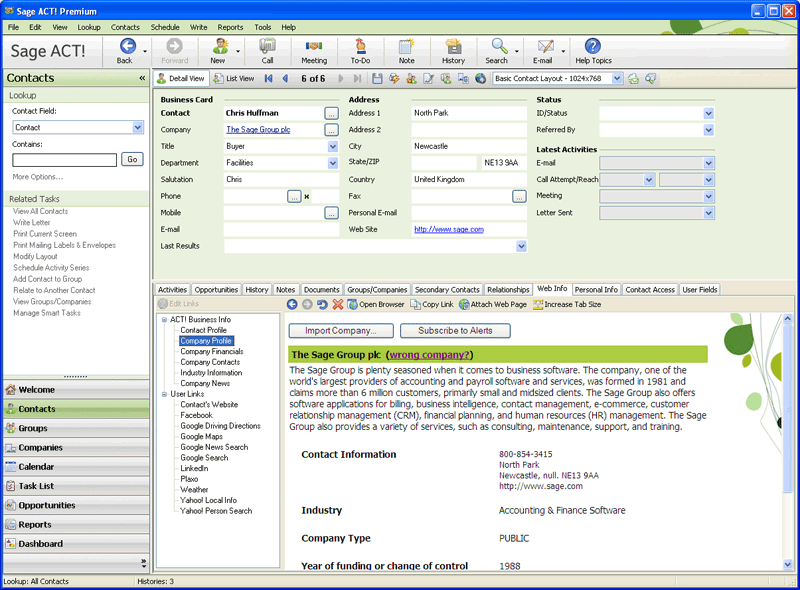 Once the survey is completed, those details are automatically populated back into Sage ACT!. Unlock a rich source of new leads. 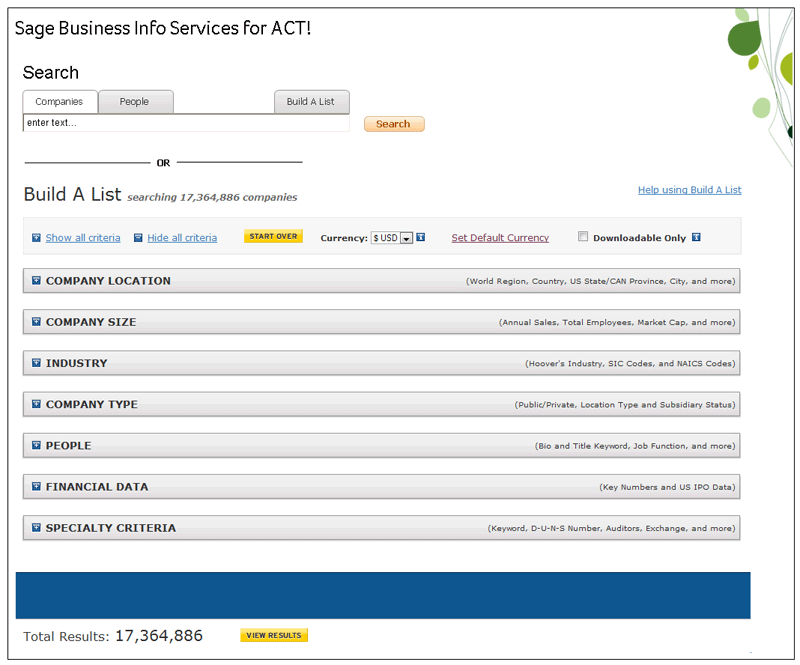 Add fuel to your sales and marketing machine with Sage Business Info Services for ACT!1, which pulls highly targeted prospect lists and business information from Hoover's™ and puts that data directly into Sage ACT!. It helps you fill in the gaps in your database and gives you access to more than 65 million companies and 85 million executives. Find new leads based on the traits you're looking for and make sure your mailed materials find their target with addresses and phone numbers that are properly formatted when imported. Start with a free version for basic company, financial, and industry info, or sign up for a subscription to get more detailed contact, company, competitor, and lead information. Sage ACT! manages all the details of your business relationships and Microsoft® Outlook® manages emails, basic contact details, and meetings across your team. Now you can integrate your Sage ACT! 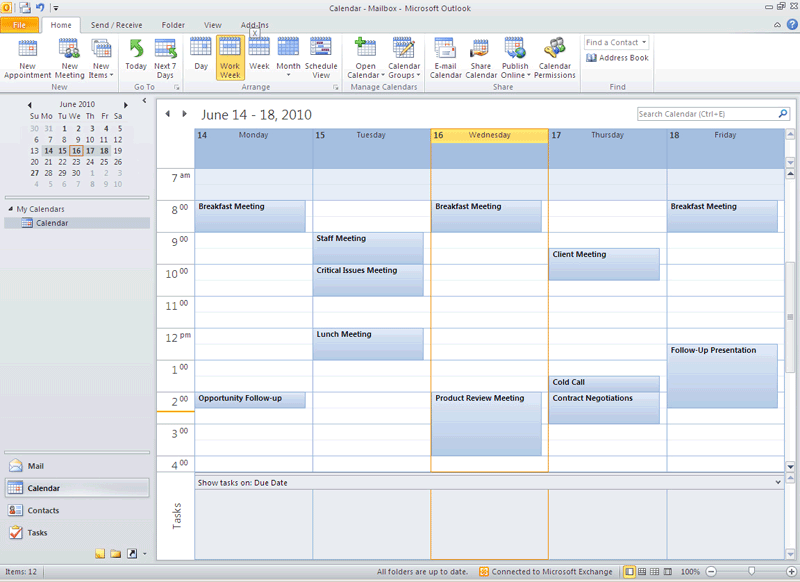 and Outlook contacts, plus keep your calendars in sync. Everything will be kept updated in both places. Keep your busy schedule updated in both Outlook and Sage ACT!, no matter where you add or modify activities and meetings. Sage ACT! will help you cut back on meeting conflicts with rules that handle them automatically. 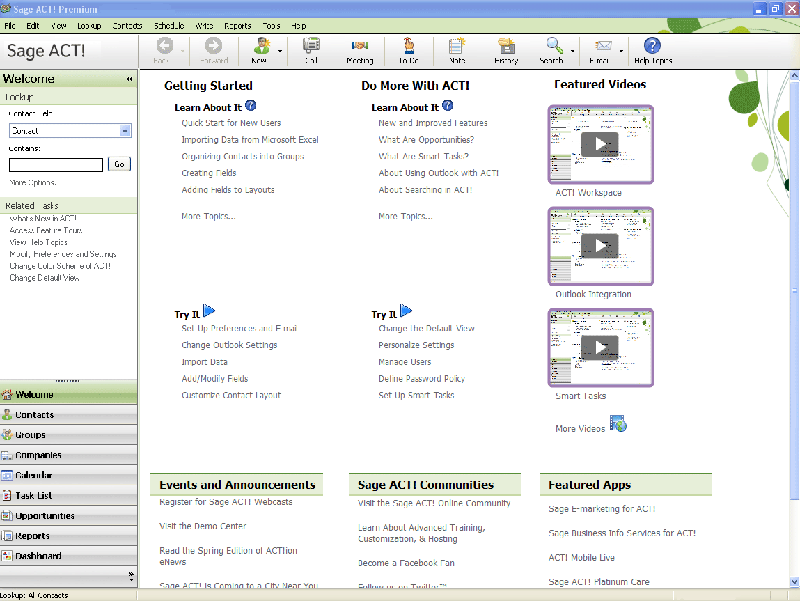 Choose which contacts and activity types in Sage ACT! sync back to Outlook. 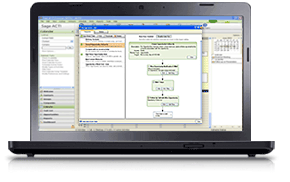 Benefit from additional enhancements made to Sage ACT! 2011, including the option to import data directly from Excel®, a re-designed Welcome Page with featured videos that help you get the most out of Sage ACT!, and security settings that prevent sensitive email history from attaching to Sage ACT! user records.